Being a concerned friend, when Mark Kreutzer donated to the Carry On Campaign, it was with the express intent of filling a terrible gap in my 1980s romantic-comedy education. To which I can only say that I now owe him a debt of gratitude; for quite a gap it was, and glad I am to have learned better. The mobster comedy is a noble old form that goes back into the 1930s, hitting such heights as Ball of Fire and Some Like It Hot; but despite the frequent appearance of the Mob as a comedic foil in comedies throughout Hollywood's golden age, the subgenre began to dry up in the years of Coppola and Scorsese; as though, now that the mobster drama had become a truly artistic style, it seemed unfair or, God help us, inappropriate, to poke fun at gangsters and their ways. Now, with actors like Robert De Niro happily (or unhappily) parodying their own tough-guy status in comedies and comic action films, it might seem odd to even bring it up, but the 1980s were a low point for the form, which was only revitalized - critically, at least - when Jonathan Demme, a director known neither then nor now for being terribly concerned with generic throwbacks, directed a neo-screwball mob picture that helped to make a star out a promising 30-year-old actress named Michelle Pfeiffer. 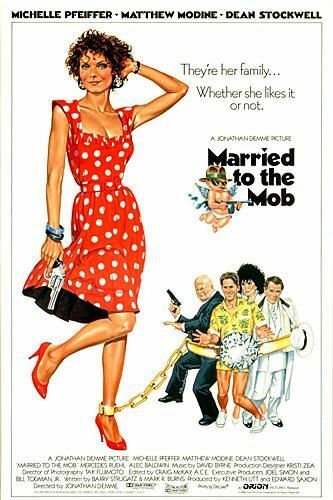 Married to the Mob is not a great motion picture, but it's a hell of a lot of fun to watch, thanks to a damn sturdy cast and a director with a sublime ability to make fluff seem deeper than it really is. Thought its plot is twisty and gnarled, the hook is quite straightforward: Angela de Marco (Pfeiffer) is the wife of a high-level mafia enforcer, "Cucumber" Frank (Alec Baldwin, looking all of 16 years old), and she pretty much hates the life. So when Frank is offed for sleeping with the boss's mistress - that's Tony "The Tiger" Russo (Dean Stockwell), as wiry and unpredictable as a movie don has ever been - Angela sees it as her chance to escape with her kids to an anonymous hidey-hole in a particularly crappy corner of Brooklyn. Unfortunately for her, Tony is smitten with his late employee's widow, and he tracks her down in no time flat, as do FBI agents Mike Downey (Matthew Modine) and Ed Benitez (Oliver Platt), who move into the apartment upstairs from Angela to set-up a recon post. With all due predictability, Mike, disguised as a plumber, falls in love with Angela, while Tony's intensely jealous wife Connie (Mercedes Ruehl) starts to harass the woman she's convinced is trying to steal the boss. The difference between Married to the Mob, the tedious mob comedy in line with Wise Guys from two years earlier, and Married to the Mob, the disarming and delightful film that holds up surprisingly well after more than two decades, is that the script by Barry Strugatz & Mark R. Burns (who re-teamed the following year for She-Devil and thereafter faded into obscurity), or at least Demme's treatment of it, is a classically-structured farce. Oh, sure, a farce decked out in '80s trappings and cultural references, but the exact manner in which complications are layered one atop the next, as lies and misunderstandings compound, only to be swept away by an incredibly busy final sequence (which is in and of itself one of the great extended comic exercises of the 1980s), is very much in keeping with a style of comic storytelling that has never been entirely forgotten, though its cinematic peak was decades before Married to the Mob was produced. Married to the Mob's revision to a late-'30s idiom of comedy, blended with a frank contemporary attitude, required a very deft and energetic hand, which Demme provided with great success. One of the director's great skills throughout his career has been the way he fills his frame with details, and the busy story is accompanied by an equally busy mise en scène that visually reinforces the hectic goings-on; not to mention the director's usual attentive ear for how music can reinforce the energy of his movies (the score is by David Byrne of the Talking Heads, the subject of Demme's excellent 1984 concert documentary Stop Making Sense; singer Chris Isaak appears in a small but memorable role). The opening scene, set to Rosemary Clooney's mob movie stalwart "Mambo Italiano", is a typical example of how the movie operates: a bubbly sound mix married to breezy but not over-fast editing, with the camera settling in just when it needs to to capture the right dialogue to keep the movie speeding on without overloading us with information. Generally speaking, the movie is a perfect example of how tight directing can give a funny, shallow movie all the oomph it needs to remain memorable; though it's not a film that one would use as a showpiece of Demme's skills, it's impossible not to be aware of his touches throughout, constantly elevating the material. Beside excellent direction, the film is blessed with its cast: virtually nobody is off except for Modine, who was still recovering from the emotionally brutal Full Metal Jacket shoot, which perhaps explains why he spends all of Married to the Mob looking a bit shell-shocked. Otherwise, everybody is excellent, though there are three performances in particular that rise above and beyond the occasion. Of these, it's Ruehl's performance that needs the most added attention: as a broad caricature of Italian-American womanhood - and Ruehl does not challenge or rise above this caricature, it must be said, but one of the chief problems of Married to the Mob is the, um, enthusiasm with which every moment of the film indulges in stereotypes - Ruehl is convincingly messy and funny, while managing to gather every gasp of sympathy she can pull in for a woman who is, after all, the most consistently wronged character in the whole picture. Stockwell received a few nominations, including at the Oscars, for his great work as a mob boss, finding a delicate balance between violent excess and idiocy, creating a credibly dangerous villain who never threatens the light comedy of the movie, and does it all deliciously far from his comfort zone. The best in show, however, must be Michelle Pfeiffer, in one of the key performances in her run of films in the '80s and '90s that established her a bona fide movie star (in the same year, she co-starred in Dangerous Liaisons; The Fabulous Baker Boys was just over the horizon). It's a somewhat atypical role for the actress, but one she nailed: indeed, it's her steely combination of wits, determination, romanticism, and the ability to work her way around a snappy line of dialogue that put me in mind of the great screwball comediennes of the '40s and first clued me in to the debt Married to the Mob owed to that excellent tradition. All in all, it's an excellent bit of fun, almost entirely disposable; still, there's no denying the huge piles of talent onboard, and a funny comedy is never a thing to dismiss outright. Time has been inordinately kind to Married to the Mob; I'm sorry it took me 22 years to catch up with, and I think it likely that 22 years hence it will still be every bit as sparkling and delightful as it remains today.